Hypereosinophilic Syndromes (HES) are a group of rare disorders in which high numbers of eosinophils are found in the blood and tissue, for prolonged period of time (6 months or more) for which a cause cannot be found. While most people have blood eosinophil levels of less than 500/ml, those with HES typically have blood levels of more than 1,500/ml. Continuous presence of high number of eosinophils in blood can eventually cause multiple organ tissue damage as these eosinophils infiltrate different tissues and cause inflammation. HES can affect any organ in the body, including the stomach and intestines, the heart, lungs, skin and other organs. The cause of HES is not known. While both men and women may be affected by HES, the disease is more commonly seen in males ages 20-50. While it is more commonly diagnosed in adulthood, it has also been diagnosed in children. The symptoms of HES may vary widely, depending on the part of the body that is affected. Symptoms may include cough, fever, fatigue, shortness of breath and wheezing. 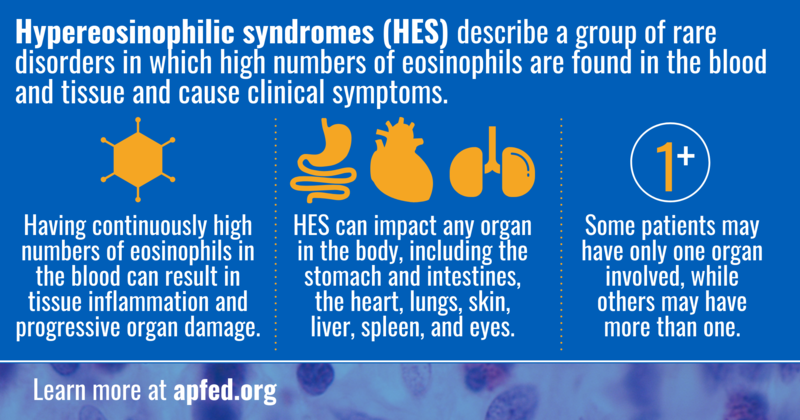 The symptoms of HES are also common in many other medical problems, including autoimmune diseases, allergic disease, cancer, and drug reactions, making HES more difficult to diagnose. Since many different problems can cause high numbers of eosinophils in the blood, higher than normal blood eosinophil number alone does not mean an individual has, or will develop, HES. Criteria has been developed that must be fulfilled for an individual to be diagnosed with HES. Peripheral blood eosinophilia (high numbers of eosinophils in the blood) more than 1500 eosinophils, for at least six months’ duration. End-organ (heart, lungs, GI tract, brain, skin, etc) involvement with eosinophil tissue infiltration (invasion) and injury. Exclusion of known other causes for the eosinophilia such as parasitic infections and certain bone marrow/blood diseases. Tests are needed to diagnose HES and include a complete blood cell count, including eosinophil count, blood samples for liver and kidney function, and blood tests for Vitamin B12 and tryptase. Depending on symptoms and test results, other studies may be performed. For instance, ultrasound (echocardiography) is used to look at the function of the heart. A chest x-ray may be done to examine the lungs. A bone marrow biopsy is recommended in patients suspected of having HES. It commonly reveals high number of eosinophils and some other abnormalities, suggestive of an innate bone marrow/blood disease of eosinophils. Therefore, HES is classified as hematologic neoplasm (disease of the blood and bone marrow) and is part of the larger group of Myeloproliferative Neoplasms. Closely related disease to HES is chronic eosinophilic leukemia (CEL). Major difference, in simple terms, is that in CEL all eosinophils found in the bone marrow and blood are proven to be identical (also called “clonal”, meaning that all originate from the same, one, abnormal eosinophil). The disease may be diagnosed and monitored by a team of specialists, such as allergist/immunologist, hematologist, and/or cardiologist. Treatment goals include decreasing blood eosinophil numbers, preventing organ damage, and slowing disease progression. Treatments vary based on organs involved and disease verity, as well as on the presence of other medical problems a patient may have. Therapy for hypereosinophilic syndrome requires careful discussion with your health care providers regarding the risks and benefits of the treatment for your specific HES- related organ involvement. HES treatment may include glucocorticosteroids (i.e., prednisone) and chemotherapy medicines such as chlorambucil, hydroxyurea, and vincristine. Frequent injections of interferon-alpha may also be prescribed. Improved treatment options for HES are an area of ongoing research, including the use of tyrosine kinase inhibitors (i.e., Gleevec, Dasatinib, and Nilotinib) and anti-interleukin-5 (IL-5) monoclonal antibodies (mepolizumab and reslizumab). Systemic steroids are often needed to treat HES with organ involvement or with systemic symptoms, like a severe rash, fluid retention, and similar. Steroids are medications that fight (suppress) many types of inflammation. They are not specific for suppressing eosinophils, although eosinophils are particularly sensitive to them. Systemic steroids, those that are absorbed into the bloodstream (oral or IV), are very effective for treating a number of eosinophilic disorders. Steroids are very effective for controlling eosinophil numbers in blood and most HES patients can be maintained on oral steroid medication (called prednisone) for a long period of time with good control of the disease. However, the blood eosinophils and disease symptoms generally return once steroids have been stopped. Long-term steroid use (especially when used in high doses) has, unfortunately, been associated with certain side-effects. Serious side effects can include osteoporosis (brittle bones from bone loss), infections, adrenal insufficiency (body becomes unable to properly respond to illness or stress), avascular necrosis (collapse of the bones in a joint, usually the hip), and stunted growth. Common side effects may include fluid retention (swelling), increased appetite, “moon-face”, and irritability. Interferon alpha (IFNa) is used for a variety of diseases including infections (like hepatitis) and malignancies (like certain types of leukemia). IFNa has been shown to be effective in HES by suppressing the symptoms related to the disease. Toxicity, however, is a major obstacle to the use of this therapy. IFNa is commonly injected into the fatty tissue under the skin 3-5 times a week. Upon the initiation of therapy most patients experience influenza-like symptoms such as fever, chills, muscle aches, headaches, and joint pain. Other side effects of IFNa are low blood counts and elevated liver enzymes that require careful monitoring. These side effects usually lessen over time, but other toxicities can manifest themselves in various forms after long-term therapy. Overall experience with IFNa in myeloproliferative neoplasms is that about 25-30% of patients require discontinuation of therapy due to side effects. New long-acting forms of IFNa (pegylated interferons) have been developed over the last few years and are now approved as a therapy for hepatitis. These medications are administered only once a week and may, therefore, be better tolerated. Cyclosporine is a potent medication that suppresses the immune system and it is used primarily to prevent organ rejection in people who have had organ transplants. In some patients with HES there might be evidence that the immune cells have a role in supporting the diseases existence (so-called T cells) and cyclosporine may have a role as therapy in such cases. Anti-neoplastic agents (chemotherapy) provide an alternative approach to therapy of advanced cases of HES. These are chemotherapeutic agents that may control the disease. They are used to treat many malignancies and are not specific for eosinophilic disorders. They are potent medications that kill cells that grow the fastest (eosinophils in HES) but may potentially have harmful side effects and are reserved only for more severe cases. Careful monitoring while taking these medications is essential. Chemotherapeutic agents that have been used in HES include: Hydroxyurea, Methotrexate, Etoposide, Cyclophosphamide, Vincristine, and Cladribine. tyrosine kinase inhibitors (TKI). Tyrosine kinases are enzymes in the cells with a variety of functions. By blocking the ability of tyrosine kinases to function, TKI provides a valuable tool for controlling malignant cell growth. Several years ago a discovery was made in some patients with HES of a genetic abnormality involving tyrosine kinase called PDGFRα. In these cases, it seems that PDGFRα abnormality is responsible for disease existence. Gleevec is TKI that inhibits PDGFRα and may eliminate the disease in HES patients with PDGFRα abnormality. Genetic testing for PDGFRα abnormality is usually part of the bone marrow evaluation and can help determine if Gleevec is best first therapy. Not all patients with HES will respond to Gleevec as about 10-20% of patients may have PDGFRα. In HES patients without PDGFRα abnormality, Gleevec can be tried as therapy but it is unlikely to eliminate the disease; it may help control the disease signs and symptoms for a period of time. For patients who are refractory to conventional therapies, use of monoclonal antibody therapy (medications that selectively bind to specific proteins) should be considered. Two drugs are currently available: mepolizumab that targets interleukin-5, a cytokine in blood that is recognized as a very important protein that governs eosinophil growth, and alemtuzumab that targets the CD52 protein expressed on the surface of eosinophils (its function not yet known). Mepolizumab, therefore, by blocking interleukin-5 eliminates a cytokine from blood that provides signal for eosinophil growth. Alemtuzumab, on the other hand, by binding to CD52 kills the eosinophil. Mepolizumab is not approved therapy yet and is currently available in a compassionate-use program (http://clinicaltrials.gov) sponsored by GlaxoSmithKline, for patients with life-threatening HES that is not responding to usual therapy. Alemtuzumab is currently approved by the Food and Drug Administration for use in B-cell chronic lymphocytic leukemia. The prognosis in HES depends on the organ systems involved, disease severity and response to therapy. Outcomes can vary greatly from one person to the next. There is no cure. If HES is left untreated, the disease may be fatal. Your doctor can best answers questions about your specific prognosis in HES. Bone marrow biopsy in Hypereosinophilic Syndrome, exhibiting a markedly increased number of eosinophils. This may happen with a number of disorders, including parasitic infection. On March 23, 2018, APFED hosted a Hypereosinophilic Syndromes Patient Education and Drug Development Conference in Rockville, MD. Below are the meeting materials and the webcast recording. Please note: The recording does not include Dr. Klion’s presentation. We will update the recording to include this presentation as soon as the research that was discussed is published and we are able to show the material. Please also note that polling questions and call-in instructions that are included in the webcast were only operational during the live event are no longer accessible. 2Klion AD, Bochner BS, Gleich GJ, et al, and The Hypereosinophilic Syndromes Working Group. Approaches to the treatment of hypereosinophilic syndromes: a workshop summary report. J Allergy Clin Immunol. Jun 2006;117(6):1292-302. Simon HU, Rothenberg ME, Bochner BS, Weller PF, Wardlaw AJ, Wechsler ME, et al. Refining the definition of hypereosinophilic syndrome. J Allergy Clin Immunol. Jul 2010;126(1):45-9. Klion A. Hypereosinophilic syndrome: current approach to diagnosis and treatment. Annu Rev Med. 2009;60:293-306. Schwartz LB, Sheikh J, Singh A. Current strategies in the management of hypereosinophilic syndrome, including mepolizumab. Curr Med Res Opin. Aug 2010;26(8):1933-46. Authored by Srdan Verstovsek, MD, PhD, Leukemia Department, MD Anderson Cancer Center, Houston, TX; and Mary Jo Strobel. © American Partnership for Eosinophilic Disorders (APFED) 2008-2014. All rights reserved. Updated 9/14.